Busy like a bee; that’s what they say. Actually, this year is so hectic that I’ve barely managed to attend to some of the articles scheduled for last year – and the adjacent trips. 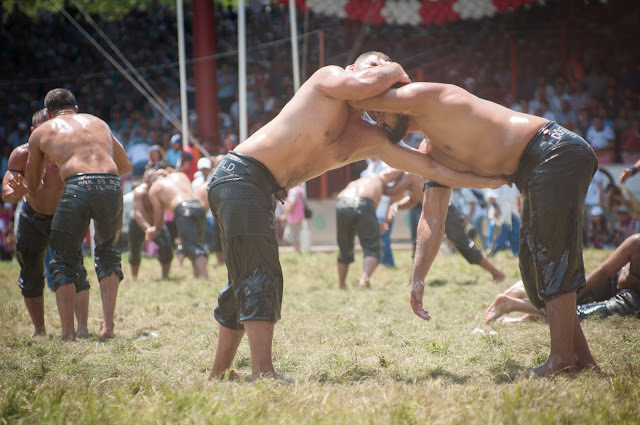 Sometimes, the shortest trips are the most intense and my second favourite of 2017 was a 3-day trip to watch the oil wrestlers taking part in the oldest sports festival in the world. And that’s Kırkpınar. Marcel and I left Braşov at around 2-2:30pm and navigated through the meanders of Bucharest traffic at rush hour. 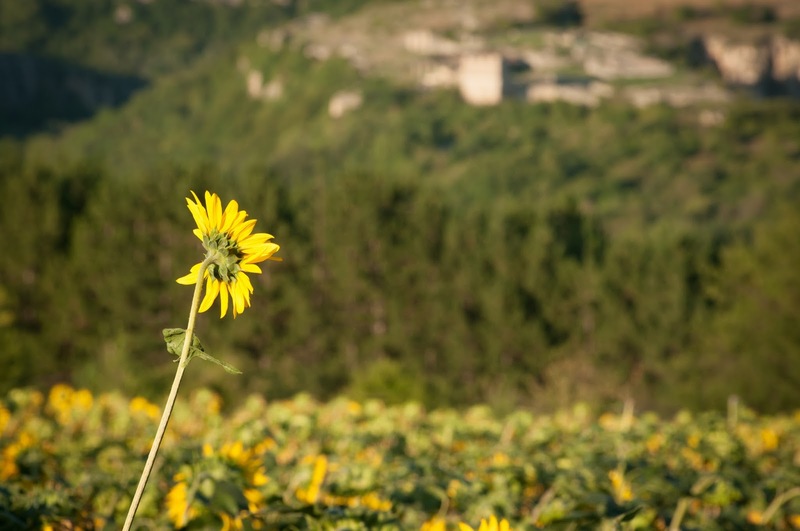 Close to sunset, we crossed into neighbouring Bulgaria and climbed the steps to the fortress of Cherven, against a sunflower background. We were the only visitors, no entrance fees were charged, and I felt truly happy to sense the (pleasant) weight of old times (11th-century old) on my shoulders. My eyes were set on some fine straw falling off piles of hay, reminding us it was July, after all. Following the winding road taking us further south, to Turkey, we managed to get to Edirne a bit after midnight. 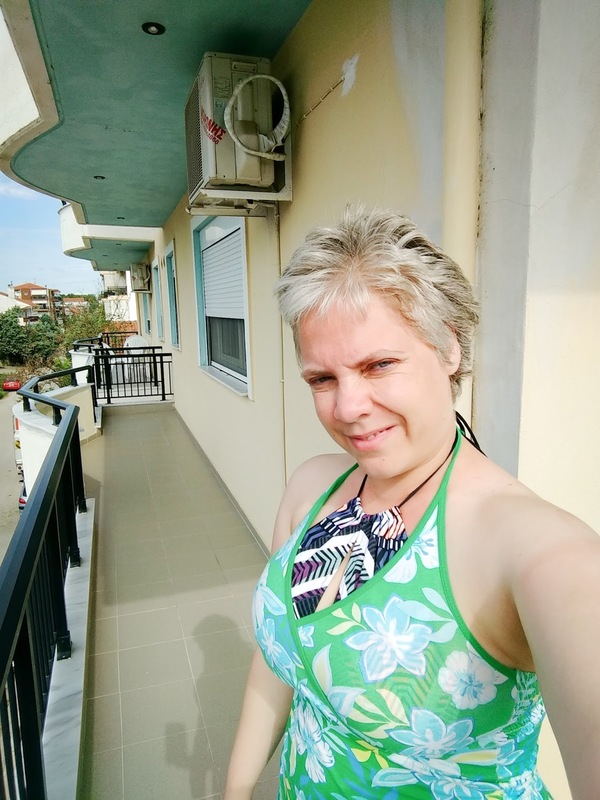 A nice surprise was our hotel – Trakya City Hotel [EUR 36; double room, ensuite, breakfast included]. What a view! We strolled to the main square, which was swarming with people – most of them men – … at 1am! I did have a Trileçe and a gooey pistachio ice cream at Tatlı Konağı and felt extremely happy to go to bed afterwards. Did I say ‘What a view’? It felt sad to leave the hotel, but there was a show to catch! On Sarayiçi Island, in the merciless heat. I did not know what to expect. The ticket for the finals of Saturday cost TL 50 and it was worth every kuruş, having led to one of the most beautiful days of last year and my entire life. We left Edirne and headed south, to Uzunköprü – home to the world’s longest stone bridge, built between 1427-1443. 172 arches. And a Provence-meets-Turkey feel. 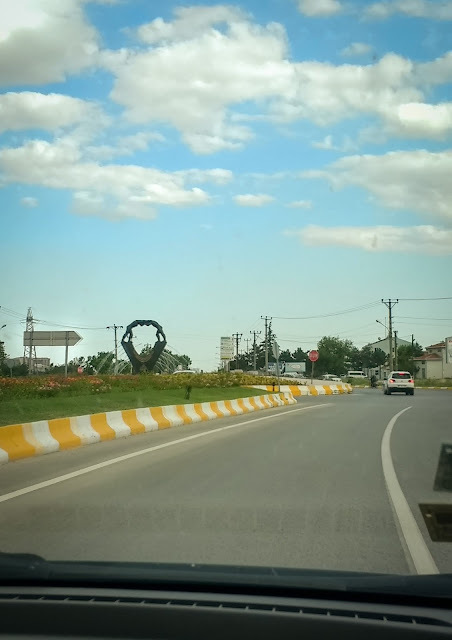 Upon our return to Edirne, we decided to go on a search for a restaurant outside the city centre, which would hopefully also have Trileçe listed under Desserts. Unsuccessful we were, so we continued towards the Greek border, stocking up on Ülker and ETI products from a very nice older man – and his store. Orestiada in Northern Greece displayed the typical je-m’en-fiche-ism of Greek settlements. The welcome at LikeHome Apartments (EUR 50) was warm and we decided we liked the place. To wrap it up, Tavern Zervas lived up to its reputation. They have such good bread, that we even took some for the following morning. Waking up to a lazy Sunday buzz of Greece is such a wonderful experience, especially after a fluffy sleep. I prepared a small breakfast for Marcel and we enjoyed it on our very own sun-drenched terrace. With all the light and rays, we thought we might add some sea to the picture. So, we drove to Alexandroupolis and turned left at one point. Samothrace was majestically reigning in the distance. And the beach was there. Not the most spectacular or neatest I had ever seen, but it was great for some dips and some snorkelling. A sumptuous lunch was badly needed. Ouzeri Alexis, not at all overpriced and family-run, was the perfect choice! The grilled eggplants with feta cheese served here reminded me of my first time in Greece. A place in my all-time Top 5 in terms of culinary experiences. They also have a very interesting in-house made cheese salad. Marcel was goofy-happy while savouring his grilled octopus. Turquoise ambiance included. Some last-minute shopping and we were on our way. Towards Bulgaria. The border control was terribly busy, but we made it. I couldn’t believe that hours before I was by the sea, talking on the phone with my Mom on matters of olive oil… and I was now surrounded by the thick mist of the Rhodopes. In the end, extreme cold and favourite Bulgarian ice cream after, we were again home and Marcel had been driving over 900 km and was definitely the hero of the day. Would we do it again? Absofuckinglutely! Actually, we’ve already booked Trakya City Hotel for Kırkpınar2018.